Ovolr! / Debackle, 9780986448980, 104pp. Artist and musician, Gary Llama, began writing down his thoughts on things in 2005. Since then he has published a few collections of these essays. 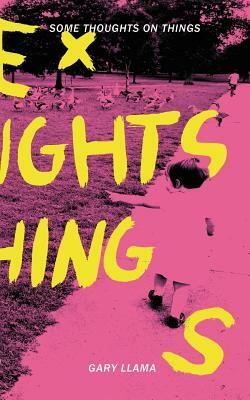 This latest collection, 'Some Thoughts On Things', is a collection of 18 short essays, but delves a little farther into the personal side of things than his past writing has. Topics include avoiding Procrastination, thoughts on social media and the accompanying aesthetic of the web, Homogeneous recordings, romanticised visions of childhood, the co-option of art by marketing, and a personal fear, as well as some more politically oriented pieces.